A run-fest between two star-studded sides well and truly in the race for the DDCA Turf 1 premiership. Buckley Ridges and Springvale South combined for a total of 578 runs in 80 overs at Park Oval during the blockbuster Round 9 clash on Saturday, but in the end, the Bucks – the ladder leaders – held off the Bloods. Returning from injury, Bucks skipper David White (149 not out) put on an absolute clinic, sending the ball flying to all parts, sending 15 fours to the boundary and eight whopping sixes. 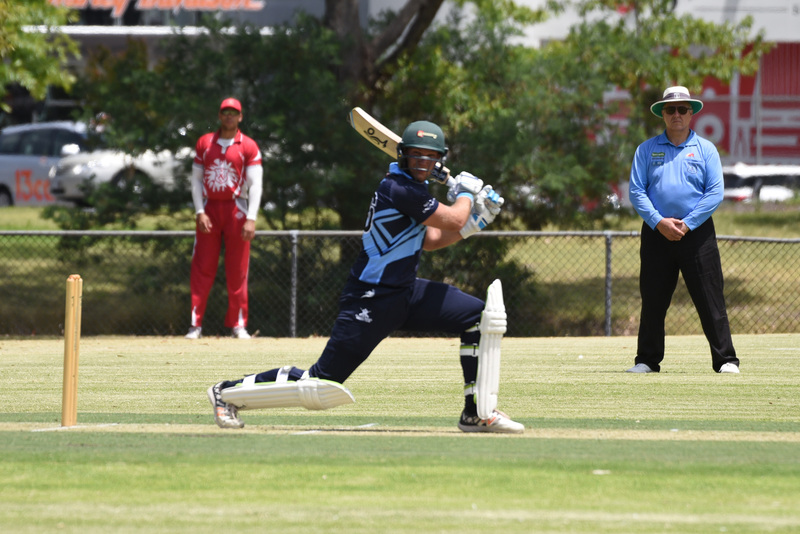 The Bucks were off to a blistering start despite an early wicket, with Daniel Watson (53 off 33 balls) in an ominous mood, but gun quick Matt Wetering (2/50) managed to stem the bleeding somewhat. The great Craig Slocombe sends one down for the Bloods. But White combined with Susa Pradeep (43) for an entertaining 101 run partnership, and the Bloods were merciless to stop the Bucks from compiling a mammoth total. Eventually, the home side reached 5/301 off their 40 overs, at an alarming run-rate of 7.5 an over. 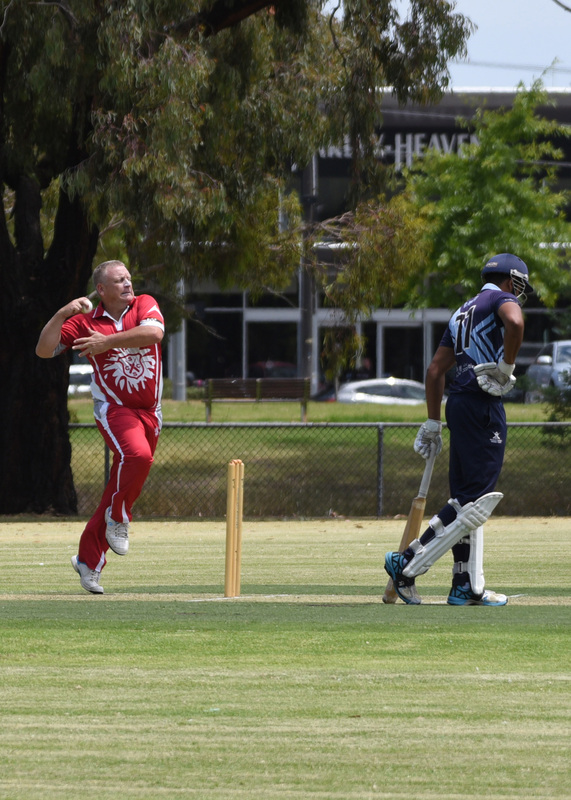 Adventurous opener Nathan King (83) plundered eight sixes as the Bloods gave the chase an almighty shake, but the Bloods were restricted to 9/277, with a crucial spell by tweaker Matthew Goodwright (3/26) proving the difference. Elsewhere, Mordialloc continued their stunning resurgence by dominating HSD at Reedy Reserve. The Cobras were skittled for a lowly 104 off 35 overs, with Liam Bence (3/21) and Matthew Newman (3/22) each starring with the ball. The reigning premiers wasted little time, running the target down with over 16 overs to spare, with Ian Daniel (29) and Damith Mapa Ralage (29) getting some runs. Premiership fancy Hallam Kalora Park, meanwhile, got the job done against North Dandenong at Frawley Road, with the Hawks cementing themselves firmly inside the top four. The Hawks did a solid job with the ball after a terrific start by Maroons openers Syed Mehmood (38) and Shehan Fernando (46), holding the visitors to 8/161 off their 40 overs. Gun all-rounder Jordan Hammond (46) got off to a blistering start, and the Hawks got the points with two overs to spare, with Ben Hillard (38 not out) and Leigh Booth (30) each contributing strongly. And capping off the round, Berwick gritted out a strong victory against St Mary’s at Carroll Reserve. The Bears were sent in to bat and did a solid job on a pitch that has seen spinners dominate all year, and despite Ruwantha Kellepotha (2/26) impressing with the ball, the visitors worked their way to 6/173, with Jordan Cleland (50) and Josh Holden (56 not out) each striking half-centuries. With Rhys Serpanchy (29) and skipper Kaushalya Gajasinghe (57) looking ominous early, the Bears rallied to dismiss the home side for 148, with junior seamer Reiley Mark (3/37) and Cory Bevan (3/26) doing the bulk of the damage with the ball. 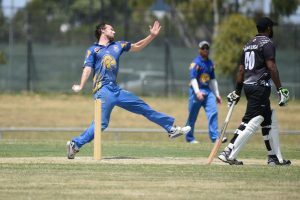 Sunday’s Round 10 fixture was once again dominated by Buckley Ridges, who claimed a relatively easy eight-wicket win over North Dandenong. David White (56 not out) and Daniel Watson (61) once again led the way as the Bucks ran down the Maroons’ lowly 134 in just 24 overs. Mordialloc also claimed a second win of the weekend after scratching their way past St Mary’s at Ben Kavanagh Reserve. Off the back of a Nuwan Kulasekera 70, the Bloodhounds posted 7/179 off 40, and the Saints got mighty close, finishing on 8/176 after Kaushalya Gajasinghe (48) once again impressed. In other games, Berwick (8/188) edged into the top four after knocking off HSD (159), while Springvale South (8/220) responded from their loss to the Bucks with an impressive win over Hallam Kalora Park (9/184). Meanwhile, in Turf 2, Narre South continued on with their dominant season by thrashing Dandenong West on Saturday. Jonty Jenner (50 and 4/8) starred with both bat and ball as the Westers were rolled for 86 in reply to the Lions’ 9/211. Dingley (3/180) were also big winners against Parkmore Pirates (8/172) , with Corey Booth (74 not out) and Matt Hague (74) starring, while Cranbourne (7/130) knocked off rivals Narre Warren (129) in a surprise result. Cranbourne speedster Tim Fathers in full flight in Turf 2. In the final game of the round, St Brigid’s/St Louis (5/143) knocked off reigning Turf 2 premiers Narre North (141). On Sunday, Narre North (2/190) bounced back with a dominant win over Parkmore Pirates (189), with Kyle Hardy (92) falling narrowly short of a century. Dandenong West (8/86) were also a side to bounce back and post their maiden win of the season, knocking over Cranbourne (84), in a big day for the Westers. After skittling the Eagles for 84 – after at one point being 8/35 – the Westers ran it down, but only just, with an anchoring innings at the top from Nathan Power (25 not out) getting the job done. Narre South(166), meanwhile, picked up a thrilling win against Narre Warren (163) at Strathaird Reserve. The Lions posted 166 with Morteza Ali (54) finding some form, before rolling the Magpies for 163, only a mere four runs from victory. And Dingley (5/211) picked up a second win of the weekend, knocking over St Brigid’s/St Louis (8/204) . Off the back of Matt Hague (62) once again and Christo Otto (74), the Dingoes posted a sizeable total. But Mark Jamieson (97) did his best to get the visitors close, with the visitors finishing on 8/204. Corey Booth (3/28) did well with the ball for his side.